A 75 year old male former Research Astrophysicist, is a patient in our office. 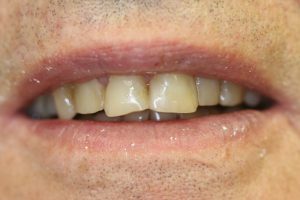 Most recently he asked about addressing his front teeth, They were worn and chipped. Below is an image of his teeth prior to treatment. Impressions were taken and models were retrieved from the impressions. The models shown below were sent to the laboratory. The models were duplicated and then altered using computers to design a new look to his front teeth. Below is an image of the new concept teeth. He liked what he saw and decided to approve the proposed care. He made an appointment, The teeth were prepared conservatively. Impressions and records were made. He was given temporary restorations to wear in the time interim during which the laboratory fabricated the conceptualized veneers. Below is an image of the final restorations. The patient was very happy upon completion. 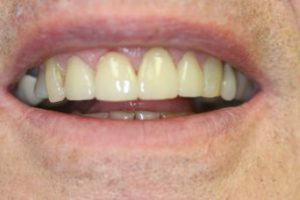 He had an occlusal guard fabricated to protect the new veneers. If you have a question about this procedure please don’t hesitate to call East Boynton Dental. We would be happy to speak to you about this case or any of the other cases shown in our blog. Impressions were taken and the models that were retrieved from the impressions, were sent to the laboratory for computerized waxing. 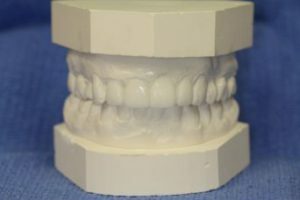 The CAD-CAM (Computer Aided Design-Computer Aided Manufacture) treated models were returned and then shown to the patient to evaluate. He liked what he saw and decided to over come his fears and proceeded with care. Below are the images of the completed case. The patient was very happy with the finished result. If you have any questions regarding this case, please feel free to contact us at eastboyntondental.com. We will be more that happy to answer your questions. Boynton Beach Dentist: A senior looking for younger teeth. Boynton Beach Dentist: Security Guard with a secret in his smile! Boynton Beach Dentist: A work from home Pharmacist/Mom wanted the Rx for a new smile. aliasy on Boynton Beach Dentist: Recommends reconstruction with an implant rather than conventional fixed bridge. 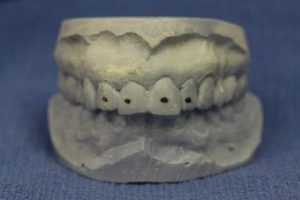 http://www.hjgame.com/member/space.php?uid=634056&do=blog&id=278534 on Boynton Beach Dentist: Recommends reconstruction with an implant rather than conventional fixed bridge. bolsos hermes españa on Boynton Beach Dentist: Recommends reconstruction with an implant rather than conventional fixed bridge.